We just discussed a pair of earrings in the Swedish royal collection that bear the name of the Vasa dynasty, rulers of Sweden from 1523 to 1654, so we might as well talk about a tiara of the same name while we're at it. This jewel resides in Norway today, but its roots are Swedish. When Princess Märtha of Sweden (1901-1954) married the future King Olav V of Norway in 1929, she received this glittering Art Deco tiara with nearly 1,000 diamonds set in platinum as a gift from the City of Stockholm. Made by C.F. Carlman, the tiara features stylized sheaf motifs representing the heraldic symbol of the House of Vasa. 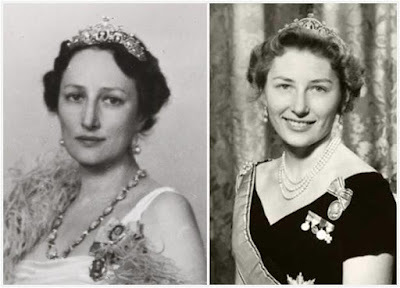 Märtha and Olav had three children (Princess Ragnhild, Princess Astrid, and King Harald V), but sadly she did not live to become Queen of Norway, dying of cancer a few years before her husband came to the throne. The Vasa Tiara now resides with Princess Astrid. On its own, the heraldic motif idea doesn't sound like the kind of thing that would make for a very pretty tiara, but I think they defied the odds with this lovely diadem. It certainly makes it an interesting piece, and it fits right in with the rest of Princess Astrid's eclectic tiara collection. She uses her unusual jewels well, but I'm always happy to see the Vasa Tiara make a reappearance. How would you grade this tiara?